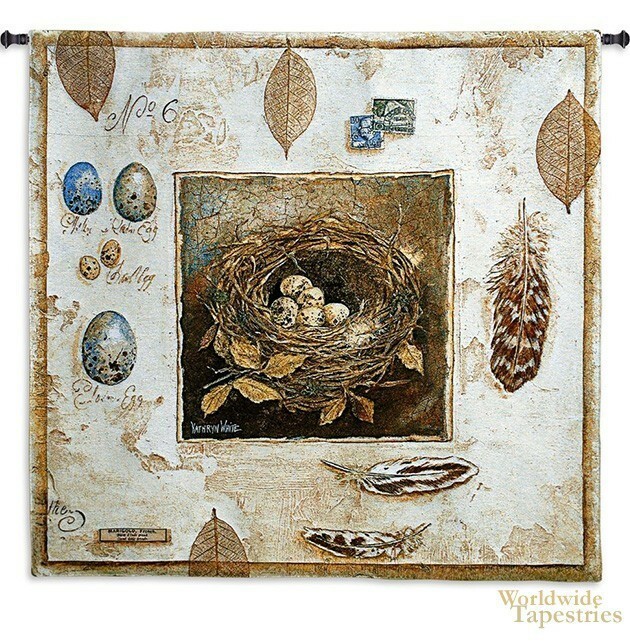 A delightful work celebrating the bird's nest is the focus of this tapestry. Bird's nests have been the subject of art and tapestries alike for centuries for its beauty and its theme of the fertility of nature. Here we see spotted egges in this lovely made nest, and a montage surrounding the image of feathers, eggs and leaves. From a work of artist, White, this piece is a beautiful rendition of a beautiful aspect of nature. The floating feathers seem to rise or fall in front of the viewer to create an effect of movement, creating an exceptionally refined work. This beautiful animal tapestry "Nested No 6 (Aviary)" is backed with a lining and a tunnel for easy hanging. Note: tapestry rod and tassels, where pictured, are not included in the price. Dimensions: W 44" x H 42"